When Dr. Michael Imhoff stepped up to the lectern in Wynne Chapel on September 3, his tall frame cast a long shadow, both literally and historically, across the audience gathered for the traditional Opening of School Convocation. His address, “The Other Side of the Mountain,” marked the beginning of the 164th academic year of the College, and also—even more significantly—coincided with the announcement that Imhoff would retire at the end of this academic year. Imhoff, the Rupert B. Lowe Chair in Chemistry, has been a member of the Austin College community since 1970 when he joined the chemistry faculty. 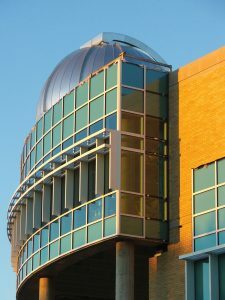 He became vice president for Academic Affairs and dean of the faculty in 2000 and has been instrumental in the planning and design of the College’s new science complex. Completion of the IDEA Center, set to open its doors to students in fall 2013, is certainly a fitting capstone to Imhoff’s esteemed career in academics. 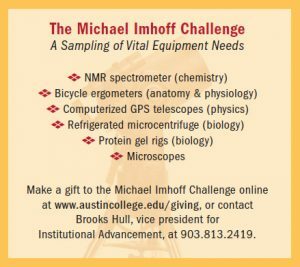 In recognition of Imhoff’s significant contributions to Austin College as a professor and administrator, President Marjorie Hass has announced a presidential challenge grant toward a fund for laboratory equipment for the IDEA Center. The Michael Imhoff Challenge will match individual donor gifts dollar-for-dollar, up to a total $250,000. Fulfillment of this challenge would result in half a million dollars to purchase vital research instrumentation in every scientific discipline for the new facility—equipping it to provide topnotch science research that will prepare Austin College students to succeed in their careers. 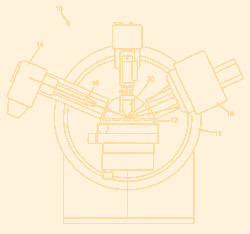 Critical equipment needs total nearly $1 million, and funding requests for several large instruments—such as a state-of-the-art 400 MHz NMR spectrometer for the Chemistry Department—have been presented to private foundations. And while some existing equipment will move from Moody Science to the IDEA Center, much of the current instrumentation has exceeded its expected life, as purchases have been held in anticipation of the departmental moves to new laboratories. 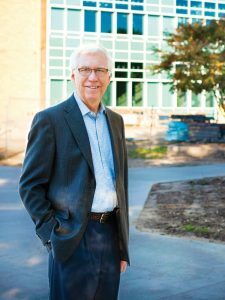 “We want to do something very special to honor Mike Imhoff’s impressive career at Austin College, and seeing the IDEA Center equipped through this challenge should be a fitting tribute,” said President Hass. On October 29, Hunt Construction—general contractor for the IDEA Center—hosted youngsters and their parents for a tour with “Bob the Builder” on the construction site of the College’s new science complex. Outfitted in hard hats, the special guests got an inside look at the building in progress, and learned a few fun facts about the enormous scale of this 103,000-square-foot facility. For this state-of-the-art, LEED-certified structure, this is the first of many outreach events to be offered to the community as the IDEA Center opens its doors for learning and collaboration. Austin College chemistry students and faculty have a new tool for learning—one that will transform the laboratory experience in several courses. In October, technicians installed a Bruker-AXS SMART/CD x-ray diffractometer in the inorganic chemistry lab in Moody Science. This advanced instrument aids in determining molecular structures of organic and inorganic compounds by analyzing the scattering pattern created when an x-ray beam passes through the subject material (typically single crystals). The new addition completes the recently-added crystal growth and determination laboratory in Advanced Inorganic Chemistry. The machine will enhance chemistry courses and undergraduate research, while placing the College among an elite group of liberal arts colleges to own such equipment. The installation was made possible when Dr. Brad Smucker, associate professor of chemistry, brokered a generous offer involving Texas Christian University and the machine’s manufacturer, allowing TCU’s current diffractometer to be moved to the Austin College campus as TCU made room for new equipment. The only cost to Austin College was transporting the instrument from Fort Worth to Sherman, and that’s where Bob Wright, senior trustee and former Board of Trustees chair, stepped in to underwrite the moving costs. Happily, the move went smoothly, and fall semester students used the machine to examine crystal structures and gather data. Among the many benefits of the new diffractometer is the enhanced experience for Austin College students to train on advanced instrumentation while examining data that has become the standard for publication in many journals.More than 60 percent of science majors at Austin College have some type of formal undergraduate research experience before graduating. The IDEA Center will have the largest telescope in North Texas, offering students in the sciences—and even non-science majors—a view of the wonders of space and a chance for collaboration with the international astronomy community through high-tech, real-time links to world-wide research projects.